고려시대의 청자 정병으로 높이 37.0㎝, 밑지름 8.9㎝의 크기이다. 원래 정병은 불교에서 모든 악을 씻어 버리는 의식에서 사용하던 용기의 하나로 중국을 거쳐 전해진 서방(西方) 양식이었으나, 고려에 와서 가장 세련되게 나타나게 되었다. 이 작품은 이러한 유물 중에서도 뛰어난 걸작으로 청아한 담록색 계통의 비취색 유약에 백토(白土) 상감만으로 새겨진 버드나무와 갈대, 연꽃, 원앙새 1쌍을 회화적으로 배치해 놓고 있다. 병 목에는 앞뒤 양면에 모란꽃을 하나씩 상감했다. 물을 따르는 부리는 8각으로 기품있게 만들어 병 목 위에 수직으로 세워 놓았다. 물을 넣는 아가리는 둥근 어깨 한쪽에 아담하게 붙어 있는데, 원래 뚜껑이 있었으나 없어진 상태이다. 대체로 이른 시기의 상감청자는 유약이나 바탕흙이 매우 정선되어 있고, 청아한 비취색 유약이 세련미를 보여주는 것이 특색인데, 이러한 바탕 위에 상감무늬가 곁들여졌던 만큼 한층 더 장식 효과를 높일 수 있었다. 이 정병 또한 이러한 이른 시기의 상감청자로 매우 정제되고 세련된 양식을 보여주고 있다. This celadon kundika of Goryeo (918-1392), which has height of 37 centimeters and base diameter of 8.9 centimeters, is a Buddhist sacrificial vessel used in a ritual to purify the offerer. This type of water sprinkler is known to have originated in India but was introduced to Goryeo via China, where Korean artisans in the medieval times produced some of the finest kundika bottles remaining today. 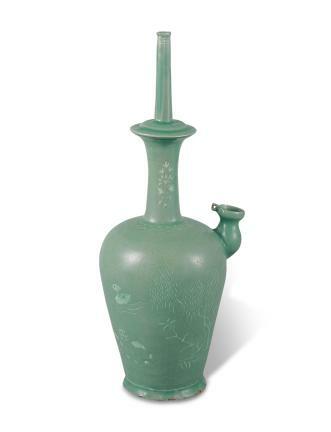 As one of such masterpieces, this ritual bottle features an elegant body with the surface evenly coated with translucent jade-green glaze and inlaid with willow, reed, and lotus as well as a pair of mandarin ducks in white slip. The bottle also displays inlaid peony blossom designs on the opposite sides of a long neck, slender, octagonal spout rising above it, and another spout attached to the shoulder designed to be used to fill the bottle with water. The latter spout originally had a matching cover that is now missing. 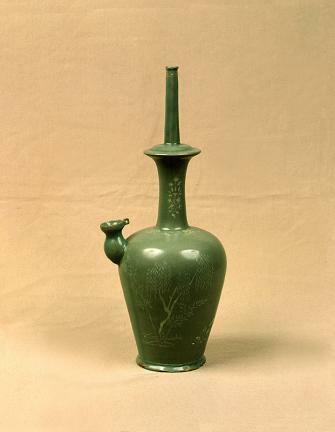 The bottle is highly praised among art historians for the creative inlaying technique used for surface decoration as well as the elegant body made with extremely fine-grained clay and clear jade-green glaze coating it.